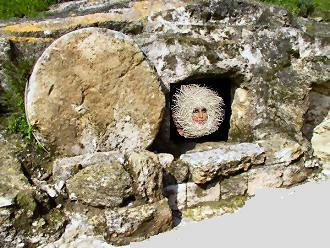 Lady Gaga: Sealed In Christ’s Tomb for Easter and Forever. Home → Damien Zone → Lady Gaga: Sealed In Christ’s Tomb for Easter and Forever. Lady Gaga has agreed to lock herself into Jesus Christ’s tomb with the hopes that she will be able to summon the forces of Satan to move the 50 ton stone before she suffocates. She is doing this to promote her album just in time for the Easter shopping season. What Gaga does not know is that Judas, the nasty apostle, has accepted money to have the rock welded shut and that Lady Gaga will either suffocate or starve to death. This is a good thing because Lady Gaga is a no-talent and if she is locked behind a giant rock for the rest of time we will not have to bother with her. Two British Tourists Murdered in Florida By Savage Monster.